Vigilante films have flourished in American cinema for quite a while now, from the saga of Paul Kersey in the Death Wish series to more contemporary entries like Man on Fire and Taken, all with their own specific brands of volatility. One thing that most entries in the genre share in common is that they typically revolve around the protagonist either being or transforming into a capable, shrewd revenge-seeker, charging through his targets in a form of retribution fantasy. 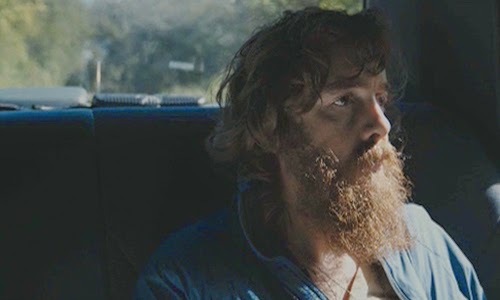 Such isn't the case for Blue Ruin, the tale of a willful vagabond who's drawn out of isolation when a murderer to whom he's connected gets released from jail. Director Jeremy Saulnier's fusion of arthouse and grindhouse sensibilities funnels into a unexpectedly poignant yarn about the crippling nature of fear and almost-obligatory wrath, seen through the eyes of the very definition of an improbable hero. 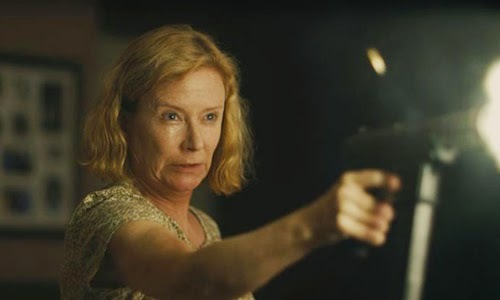 With measured doses of violence and a vein of suspense built around the main character's unexaggerated ineptitude, it's an absorbing divergence from what's expected of the genre. Blue Ruin begins with a homeless, heavily-bearded man, Dwight (Macon Blair), shacking up in a vacant seaside house, where his respite from a life of scavenging and sleeping in his rusted car gets halted by a vacationing family, presumably the owners. He's thrust back onto the beaches and under the boardwalks of his everyday life for us to witness, until a police officer with knowledge of his identity notifies him that somebody has been released from jail, somebody responsible for a double murder. Who this is, precisely, and what they've done becomes part of the film's gradual unraveling mystery, a secret which Jeremy Saulnier cleverly guards until the time's right. The information about the convict's release is enough to send Dwight, a seemingly modest and docile person, into a panic of internal turmoil, destination preparation, and the search for some kind of weaponry. Once he gets his revenge for these personal wrongs, what's Dwight going to do about his well-being, and will his act of vengeance be met with repercussions? Director Saulnier places a lot of faith in his audience to observe underlying details in Blue Ruin without them being explicitly tied together, relishing the nearly-wordlessly abstract ways he connects the dots of Dwight's mystery and detached life. The film etches out an inspired underlying backstory for the main character through the ways he sustains himself -- recycling, freeganism, thievery -- as he's forced out of his life of seclusion, where his minuscule talents are tested in his voyage towards the convict's area of release. Saulnier's script cleverly subverts the audience's expectations of how Dwight might resolve or escape situations, replacing the rousing gravitas of a determined man on a mission with doses of realism that obstruct his drive towards revenge. Getting injured or cornered in a situation doesn't simply lead to obligatory scenes of this hero gracefully conquering the odds, and that's part of the intelligence navigating the story. That's because Dwight is the epitome of an unlikely hero and ill-equipped vigilante: he's an everyman who disappeared when times grew tough, developing elementary skills of street survival that the necessity of his self-imposed seclusion forced upon him. One look upon his scraggly beard and tattered clothes suggests a different turn of events in his life, no luck and hard knocks, but that slowly gets replaced as the details of his previous life come into focus, about the deeds of the convict he fears and the family whom he abandoned. Macon Blair's performance cannot receive enough acknowledgment for credibly presenting a likably inept, anxious individual who feels obligated -- both to his history and to his own crippling anger -- to claim vengeance, whose inner conflict over what's coming next can be seen in the way he struggles to procure a gun, handle a blade, and clumsily hide in the shadows. Our experiences with him are smartly voyeuristic at first, a hands-off and neutral approach that lets the audience's perceptions of his moral compass go where they will. As Saulnier's strikingly natural photography depicts the flight of this distraught and vengeful man through American's landscape, embellished with looming fog and wheat fields passing alongside his symbolically neglected excuse for a car, Blue Ruin accelerates to Dwight's destination in Delaware ... and then promptly flips its intentions in the aftermath. Instead of drawing out the process of getting payback, the film focuses on the cascade of incidents following Dwight's irrational actions, building a steady and disquieting simmer of responsive tension while he contacts those who were once close to him -- including his best friend (Devin Ratray), an out-of-practice ex-Marine -- and prepares for backlash from those aligned with the convict. His lack of competence in high-tension situations creates an absorbing ricochet of developments that have been expertly composed and edited to embrace the mood, given force by curt, hardnosed bouts of violence way outside of Dwight's comfort zone. It creates the kind of electric atmosphere where roughly twenty words from the right person can both cement and upend everything known about Dwight's story, meshing routine Hollywood-caliber exposition and livewire tension with startling, yet credible, twists. Through the course of its restrained intensity, Blue Ruin undercuts the potential for exploitation in its thrills with eloquent personal storytelling, taking its tone closer to a fusion of Jeff Nichols' depiction of rural conflicts and the Coen Brothers' raucous drama. Dwight's inability to cope with grief and his decision to live off the grid enrich the bumps along his morally-questionable journey, where he struggles with the credibility of others and some somewhat philosophical musings about the changeableness of spoken truth, the decision to abandon memories and identity for safety, and the boundary separating justifiable and vain redemption. His story becomes more interested in emotional catharsis built around those ideas than satisfying bloodlust and the fantasy of retaliation, which guides the film down a path that emphasizes Dwight's fallibility and limits. The fact that this homeless man with wide, weatherworn eyes isn't a composed ex-military renegade or trained assassin becomes director Saulnier's strongest asset as Blue Ruin approaches its methodically tense exhale of a conclusion, leaving its mark as a fine piece of versatile indie filmmaking.